This book is designed as a basic support for the higher education of undergraduates in Business Administration and Management and other similar degree courses who have an interest in subjects related to Management and Strategy, and who are studying the syllabus in English. The text is especially recommended for short courses, and has been adapted to the teaching methods proposed by the European Higher Education Area (Bologna Process). It may also be of great use as an introduction to the subject for post-graduate students on courses at universities, business schools and similar institutions, in subjects related to Strategy, as well as a required reference tool for all those professionals and business executives who from a practical perspective assume a predominantly applied view of business and are responsible for managing and advising firms. Through this three-pronged approach, the book is an introductory handbook that covers the more salient issues and problems that make up the theoretical corpus of the management model referred to as Strategic Management. The book analyses the Strategic Management model as a prevailing paradigm in Management. This model seeks to interpret the development of business activity in order to enable it to effectively respond both to the opportunities and favourable situations that the external environment presents, as well as to those other threats and challenges that might also emerge. All this without losing sight of the internal resources, capabilities and strengths the firm itself possesses, and any weaknesses it may still have. The result of the confluence of these factors is a point of departure that provides a platform for establishing the various alternatives or courses of action that permit a firm to achieve its established goals. The process culminates in the implementation of these alternatives. This is, in essence, Strategic Management. Chapter 1 is introductory and seeks to present the basic fundamentals of what is understood by Strategic Management. It therefore defines the concept of strategy and other related matters, and considers the various levels involved: corporate, competitive and functional. The phases of the process are also analysed by adopting a strictly rational approach to decision-making, and certain considerations regarding the actual field of Strategic Management are also provided. Following this presentation, the text addresses Strategic Analysis, with the first part (Chapter 2) considering the matter of identifying a firm’s future direction (vision, mission, and strategic goals) and the different ways measuring its performance (through criteria of profitability or value creation). This is followed by an analysis of stakeholders, especially managers, as opposed to shareholders, and the ability the latter have to control them. This is an area referred to as corporate governance. The chapter concludes by considering the corporate values expressed by the assumption of principles of corporate social responsibility and ethical conduct. Strategic Analysis contains a further two parts: environmental and internal analysis. Environmental analysis (Chapter 3) investigates all those factors in the environment that affect a firm’s operations. In turn, regarding this external analysis, a distinction is usually drawn between the general and competitive environments. The former studies the factors that, from a generic point of view, influence managers’ behaviour, and techniques such as the environment’s strategic profile and industrial districts will be considered. The latter, the competitive environment, focuses on the type of business the firm pursues, and to do so it will use Porter's five-forces analysis and the industry segmentation analysis. Internal analysis (Chapter 4) tackles those factors specific to the firm, and therefore within its decision-making powers. There are different instruments of analysis that shed light on the company’s internal situation, such as its identity, strategic profile, the value chain, and the SWOT analysis. Note should be taken of the importance that needs to be given to the analysis of resources and capabilities, as a theory explaining why different firms operating in the same industry have different competitive advantages. As mentioned earlier, the purpose of this entire first part is to identify the opportunities and threats the environment poses for the firm’s operations, as well as the strengths and weaknesses it has. The foundations are thus laid for the establishment of different strategies. This leads into the second part of the book dealing with Strategic Formulation. This block will study strategies at corporate or firm level and strategies at business level. The main focus at corporate level is the definition of the scope of the firm or sum of businesses in which it seeks to compete and the different types of development and growth. At business level, and once the businesses have been defined, the key issue is to decide on how to compete more effectively and be successful in each one of them; in other words, discovering how to gain a competitive advantage. Strategies at business level (Chapter 5) study basic competitive strategies and strategies based on the industry’s degree of maturity. Following an introduction on creating and sustaining a competitive advantage, the chapter delves further into the two classical advantages propounded by Porter: cost leadership and differentiation advantage. The analysis is rounded off by an extension of the original model that also identifies hybrid competitive situations. A subsequent analysis is made of the possible strategies to be followed for emerging, growing, mature, and declining industries. Corporate strategies are included in chapters 6 to 8. These cover business development strategies –expansion, diversification, and restructuring-, ¬the types or methods of development –mergers, acquisitions and alliances- and internationalisation strategies. Development strategies refer to the expediency of continuing to operate with the same products and/or markets or enter and/or leave new businesses. These strategies are dealt with in Chapter 6, which analyses the main reasons for following one or the other, as well as the different types they may entail: expansion, related diversification, unrelated diversification, vertical integration, and restructuring, both of existing businesses and of the firm’s own business portfolio. Chapter 7 is devoted to the study of business development methods, distinguishing between internal and external development. The chapter focuses especially on external development, analysing both merger and acquisition processes, and alliances. They all include an investigation into the motives, advantages, drawbacks, types and problems involved in their management. Finally within this block, Chapter 8 deals with internationalisation strategy, analysing the concept of multinational firm, the reasons for internationalisation, the factors and strategies for global industries, the ways of entering foreign markets, and the specific issues facing a multinational firm, with reference to aspects such as offshoring, commercial and cultural factors, the management of human resources, and structural design. The third and final part of the book is devoted to Strategic Implementation, being contained in Chapter 9. 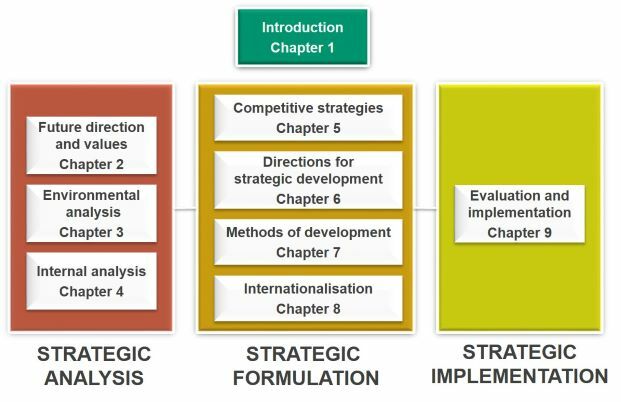 This chapter deals with the process of evaluating and selecting strategies according to criteria of suitability, feasibility and acceptability, the issues surrounding the practical implementation of the strategy in which four main aspects stand out: organisational design, management and leadership systems, strategic HR management and corporate culture, as well as the planning and control systems that complete the process of Strategic Management. All the chapters contain practical examples of the application to real company practices of those aspects deemed of greatest interest and regarding which sufficient data have been made available. The overriding aim has been to find applications on well-known Spanish firms, and whenever this has not been possible, on well-known foreign firms operating in Spain. These examples seek to illustrate the theoretical content by revealing, even if only partially, the firms’ true circumstances. The book concludes with a bibliography that includes all the references cited throughout the text and which have provided the general background for the drafting of the content. The purpose of this text is to provide an introductory handbook to Strategic Management that summarises its most important aspects. This has involved an analysis of its more significant components based largely on our reference manual, Guerras and Navas (2015): La Dirección Estratégica de la Empresa. Teoría y Aplicaciones (Thomson Reuters-Civitas, 5th edition). In view of the experience gleaned from the first edition (2013), new theoretical underpinnings have now been included, with the aim being to enrich the content considered at the time. The business applications have also been updated, with new and more recent ones on the performance and circumstances of firms both in Spain and abroad. Each one of the chapters continues to feature a series of learning aids, such as the general overview of the model that highlights the location of each chapter, the goals pursued, a summary table containing the main ideas included, self-assessment exercises, suggested activities to be undertaken based on the content, and a recommended reading list that directs the reader to other specific references of interest for each one of the topics addressed. 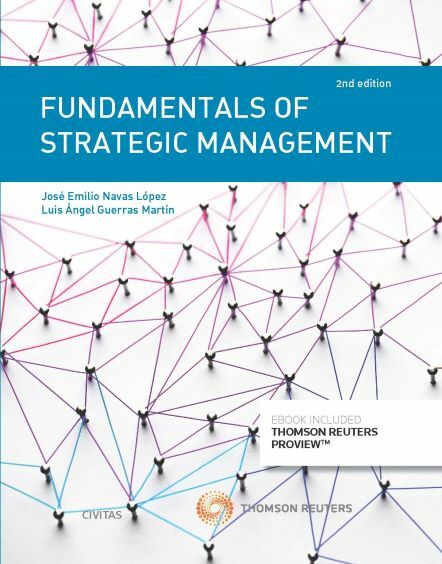 A novelty is the inclusion of a section with a link to discussion cases in the book by Guerras & Navas (2014): Casos de Dirección Estratégica de la Empresa [Strategic Management Case Studies] related to the chapter’s content. Two types of boxes have been maintained with external links to supplementary knowledge and information that cannot be included in the book for reasons of space, but which may be of great interest. The first of these, called “Access Proview”, refers the reader to the e-version of the book that provides a link to the new applications or short cases posted there, and which have not been included in the printed edition, but which can be easily downloaded from the Thomson Reuters Proview website. There is also unrestricted access to some of them at www.guerrasynavas.com, together with other learning resources (new applications and brief cases, Latin American cases, videos, interesting links, etc.). The second of these, called “Analysis”, refers to DOI (Digital Object Identifier) of articles (when available) and/or the website of different academic journals featuring scholarly papers that provide an in-depth treatment of certain topics, from both a theoretical and a practical perspective. There are also occasional references to the websites for the documentation, organisations and institutions cited in the text, where the full document can be found or additional information is available on the institution mentioned. These links appear, as appropriate, in the form of notes in the margin on the pages. It should be noted that these DOI and websites were operational at the time this book went to press, so the authors cannot guarantee they will remain accessible over time. In short, our aim has been to provide students and professionals with a better working tool that will enable them to gain a broader and more updated perspective on the content of Strategic Management.